Known as ‘The Home of Golf’, The Old Course is one of the most famous golf courses in the world. St Andrews Old Course has hosted The Open Championship a record 29 times. The Old Course, St Andrews was originally just a couple of golf holes with various people throughout the years extending it. Old Tom Morris made the final adjustments to the course in the mid 1800’s to the layout it is now. The first Open Championship was held at the Old Course in 1873. Since 1990, The Old Course has been the venue every 5 years. However, this sequence will be broken due to the fact that St Andrews will host the 150th Open Champion in 2021. One of the unique features of St Andrews Old Course is that there are only 4 holes on the course that have their own putting surface. The other holes have huge double greens where 2 holes share the same putting surface. Strangely enough the 2 hole numbers that share a green add up to 18 e.g. 4th Hole & 14th Hole, 8th Hole & 10th Hole etc. Golfers also need to be aware of the 112 giant bunkers located throughout the golf course. Each of which are named individually and has their own history, the most well-known being the hazardous ‘Hell Bunker’. The 700-year-old Swilcan Bridge, which allows golfers to cross the Swilcan Burn after their tee shot on the 18th, is probably the most iconic attractions in golf and recognised around the world. Before golfers get to the 18th however, they need to tackle what is considered the trickiest par 4 in golf; the 17th “Road Hole”. Golfers need to be very accurate with their tee shot, which flies over part of the Old Course Hotel. The Old Course at St Andrews attracts more than 42,000 rounds a year. Making it the most popular course to play in Scotland. We know playing The Old Course is every golfer’s dream! Therefore we will try our best to guide you through the best method and advise the best way of gaining a tee time on this iconic course. Each year St Andrews Links accepts applications directly from golfers for tee times for the following year. Golfer’s must apply for The Old Course along with one other St Andrews Links course such as; the New or Jubilee. This is an online application which is open for 2 weeks from late August to early September. The results of the application are usually released end of October/beginning of November. If successful the golfer will pay St Andrews Links directly for the 2-round package. We can provide you with all the relevant information and details. 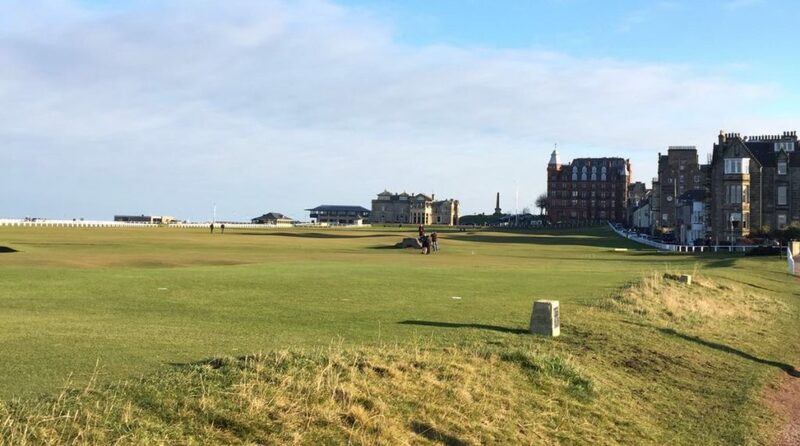 Around 50% of The Old Course in St Andrews availability is allocated by the ballot. Details are submitted to St Andrews 48 hours in advance of play . Details include names of each golfer, home club and handicap. The Ballot only allow entry for a minimum of 2 player. The results are then published later on the day of entry around 4:00pm. If successful the green fee of £190 per golfer (2019 rate) is paid to the starter on the day of play. You can enter the ballot as many days as you like as long as there are no competitions or events taking place. Please also note that there is no ballot draw on Fridays as The Old Course is closed every Sunday. If unsuccessful with the ballot, there is always the opportunity to line up at the starter’s box at the beginning of each day and they will fit you in if/when spaces become available. As a Scottish Golf Tour operator, we do have access to guaranteed old course packages. However due to the high demand to play The Old Course, St Andrews advanced booking is essential. Therefore, we recommend around 12-16 months prior to arrival. For further details, check out our Guaranteed Old Course Package. Alternatively, please contact us to find out how we can help you play The Old Course and start building your dream golf tour to Scotland….